I have a friend with some excess bricks, and I used about 50 of those to build a rocket mass heater for my newly constructed greenhouse. See the initial article here. That article has a couple pictures of the completed, but untested rocket mass heater. Here are some pictures of the RMH in action. This one shows the fire with a couple pieces of oak standing up. As the sticks burn, they self feed into the heater. I just split a few pieces off a chunk off firewood to make some sticks of the proper size, which is less than 2 inches diameter and 12-24 inches long. Downed tree branches work well, too. It’s good to have two or more similarly sized sticks because they feed heat into each other as they burn. 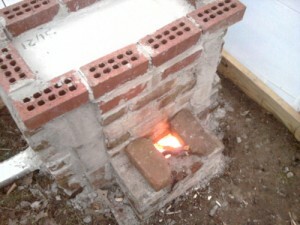 The two bricks on each side of the fire are there to limit the size of the opening. When starting the fire, smoke tends to come out the large opening rather than go through the convoluted heater path and up the chimney. Narrowing the opening encourages the smoke to go vertially up the internal path into the heater. The bricks can be moved apart after the fire gets going, and they are never anything more than warm because all the heat is going into the RMH! 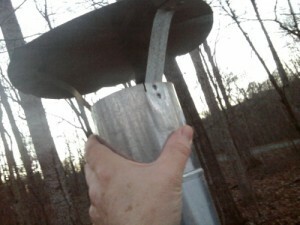 The next photo shows the exhaust from the RMH. Hard to see here in a static photo, but this is not smoke. It’s steam and CO2. The RMH is so efficient at reburning the smoke that the only thing left is water vapor and CO2. The underside of the rain cap is actually dripping with condensation. Moreover, the system retains most of the heat within the greenhouse. In the next picture, that’s my hand laying on the exhaust pipe! It’s warm, but not hot. You might think it ridiculous that you could heat a greenhouse with a few sticks, but with the heat retention of the RMH (emphasis on Mass), it’s entirely workable. This is the first time I fired up the RMH, but even without it, my transplanted broccoli and cauliflower bloomed in the greenhouse over the last month, in spite of freezing a few times. Today we harvested what was there for a pot of vegetable soup! Great job! I’m interested in building an RMH of my own for a screened in porch but am reluctant to do so without collaborating with an “expert”. Do you know of any within the Roanoke Valley? The west coast seems to have all the interest and progressive code allowances. The bigger problem is that a RMH might be a problem with your homeowners insurance. If you have a loss, they may elect to deny coverage if you have a non-code-compliant heating system. They look for excuses not to cover. Beyond that, the RMH space is about experimenting, and there are no “experts” that I know of. There are a lot of videos out that show RMH construction. 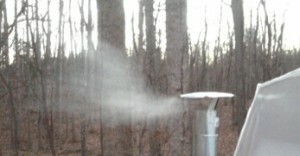 I would suggest mocking up one in your back yard to test. You’ll get an idea of how they work and how much heat is generated. You don’t want to build one too big for your porch. You can use the parts in your final version. Just don’t be intimidated by all the brick laying and concrete pouring. You can mock up a RMH pretty easily without any concrete!